A recent case out of Wisconsin has given cheerleaders something more to cheer about. The Supreme Court of Wisconsin has ruled that cheerleaders, as participants in a contact sport, are immune from civil liability for accidental injuries caused during cheerleading related activities. The case reversed a lower court’s decision to hold a local cheerleader liable for failing to catch his 16 year old teammate during a routine. She fell backward off her teammate’s shoulders, seriously injuring her head and neck. The state’s highest court applied a state law shielding participants in “contact sports” from most personal injury lawsuits. The law is well known and common throughout every state. Reckless or intentional injuries are still actionable, such as hitting an opponent in the face with your hockey stick. Injuries resulting from tackling the quarterback or knocking over a forward on a pick and roll, however, won’t end up in court, and for good reason. Almost every sport in the country would probably be buried in an avalanche of lawsuits. What makes this case interesting is characterizing cheerleading as a “contact sport” under Wisconsin law. The relevant statutory language describes a contact sport as any recreational activity involving physical contact between persons in a sport involving teams. Well, there is at least one “team.” And they definitely come into contact with each other. But a contact sport? The lower court didn’t think so, citing that normal usage of the term meant opposing teams must come into contact with one another. In this blogger’s cynical opinion, what motivated this reversal was not an appeal to clear statutory interpretation, but the same pragmatic considerations for immunizing participants that come into play for other sports. In other words: policy. 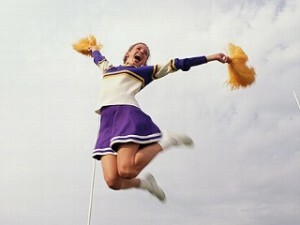 Almost 1/3rd of all catastrophic injuries to high school female athletes in the United States occur during cheerleading. Even though it may not be the biggest draw on ESPN, cheerleading is a popular activity. (Or sport, or whatever you want to call it). Ensuring that cheerleading has an affordable future free of multi-million dollar insurance contracts for participants is certainly an important consideration. Although a case about cheerleading may not jump out as the most obvious foil for a debate on judicial decision making, this case has all the elements. A statutory interpretation that could go either way, along with policy considerations that are not clear in the statute but undoubtedly under consideration by the judges. Interestingly however, both a textualist and a pragmatist can find common ground with this decision. The law was written ambiguously enough that cheerleading could plausibly be considered a “contact sport” under the law of Wisconsin. And, important policy considerations for ensuring the continued survival of cheerleading are recognized and supported, even though they are not clearly spelled out in the law. Perhaps we all therefore have something to cheer about?